While hard drives are still here to stay, thanks to their high capacities at low prices, solid-state drives are also getting cheaper while capacities are getting larger. 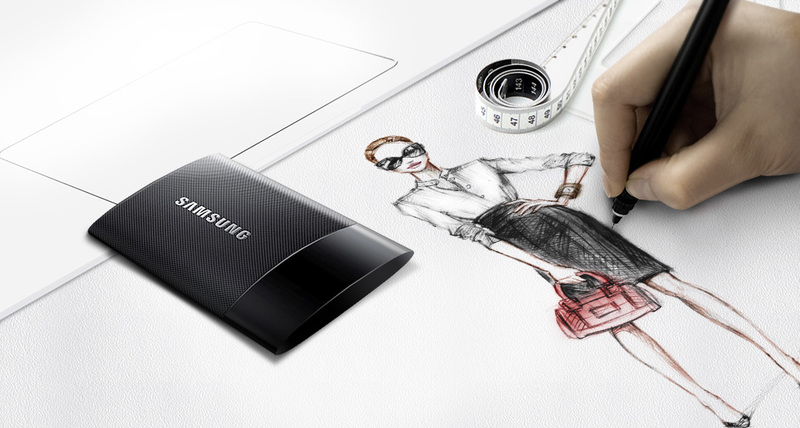 Samsung’s new offering, dubbed the T1, is an external SSD based on the popular 850 EVO 2.5-inch SSDs. With that comes fast speeds and high capacities, both at a high price. The T1 will be available for purchase later this month in 250GB, 500GB and 1TB capacities for $180, $300 and $600, respectively. Its design is sleek and stylish, and can be powered by a single USB 3.0 cable. Of course, it’s backwards compatible with USB 2.0 devices. For those who need their external data fast, this looks as though it will be a promising way to go. But, for those who primarily use external drives for media or basic documents, a traditional hard drive is still more practical (and cheaper). Below, you’ll find some images of the drive as well as the press release. There’s also a small teaser video that Samsung made that’s embedded below. 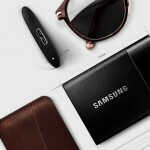 LAS VEGAS, USA – January 5, 2015 – Samsung Electronics Co., Ltd., the world leader in advanced memory technology, today unveiled the Samsung Portable SSD T1, a stylish, external portable solid state drive (SSD) that represents a new standard of storage for today’s digital life. Designed for speed and security without sacrificing style, the Portable SSD T1 is ideal for business travelers, creative professionals and content creators with a need for secure local storage they can take on-the-go and use to quickly transfer large amounts of data. Available in 250 gigabyte (GB), 500GB and 1 terabyte (TB) storage capacities, the Portable SSD T1 will launch globally in 15 countries across the United States, European and Asian markets later this month. 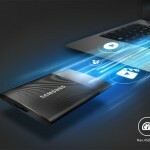 Powered by Samsung’s proprietary 3D Vertical NAND (V-NAND) technology, the Portable SSD T1 is a high-performance memory storage device recently chosen as an honoree for the 2015 International Consumer Electronics Show (CES) Innovation Awards. The new drive will be on display at the 2015 CES from January 6-9 at Samsung’s booth, 11906, located in the Central Hall. Built with the same award-winning technology as Samsung’s internal SSDs, the Portable SSD T1 saves users precious time with extremely fast read/write speeds, enabling users to plug in and quickly grab their work to present to prospective clients or partners. In fact, the drive has sequential read/write speeds of up to 450 megabytes per second (MB/s) with a USB 3.0 super speed interface and random read/write speeds of up to 8,000 inputs/outputs per second (IOPS) and 21,000 IOPS respectively. The write speed is responsive and fast like an internal SSD and up to 100 times faster than an external hard disk drive (HDD). Depending on the file size, the Portable SSD T1 has a data transfer speed four times faster than an external HDD. It takes only eight seconds to transfer a 3GB movie file and 27 seconds for a 10GB movie file compared to an external HDD which takes 26 seconds and 85 seconds, respectively. 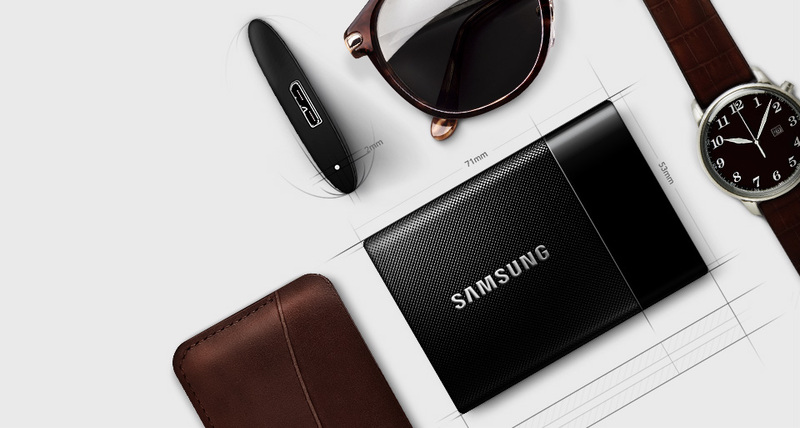 With its intuitive user interface, the Samsung Portable SSD T1 is easy to set up and protect, so professionals can be assured that their original work will not fall into the wrong hands or get lost due to design, durability or reliability concerns. 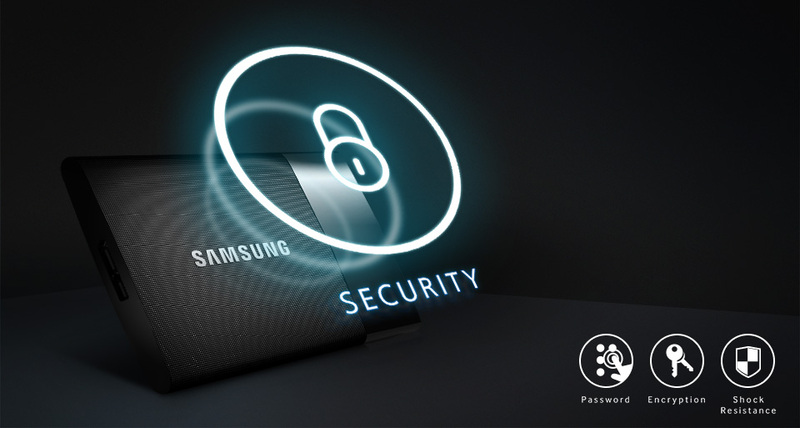 With just one user-set password, the drive is safe from unwanted access thanks to AES 256-bit hardware encryption. Unlike an external HDD, the Portable SSD T1 has no moving parts, so it can withstand bumps and drops and users do not need to worry about the wear and tear on moving parts that can result in lost or corrupted data. It is shock resistant up to 1500G/0.5ms and features Dynamic Thermal Guard, which will activate in extreme temperature conditions to protect the drive and any stored data – so users can rest easy knowing the drive can withstand even the toughest elements. The Portable SSD T1 has a slim and compact design that makes it easy to take anywhere. Smaller than an average business card and weighing about 1 ounce, it features premium aesthetics such as black chrome metal coating and laser patterning, making it the sleek, fashionable choice for sophisticated and stylish users. 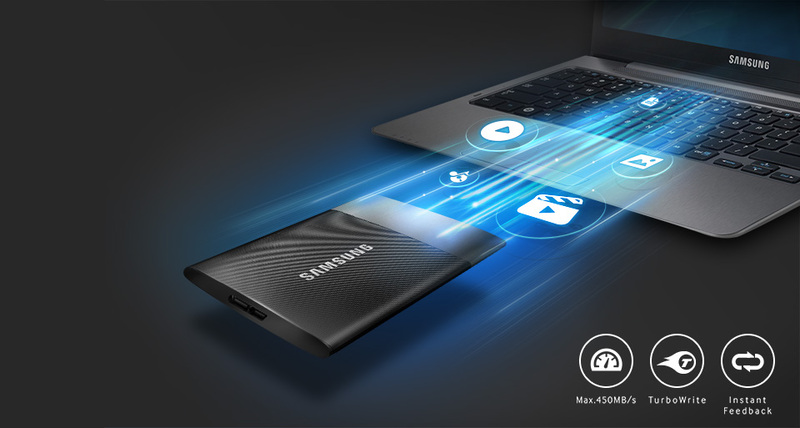 The Samsung Portable SSD T1 works effortlessly with both Windows and Mac PCs using the exFAT file system, eliminating the hassle of having to reformat for every type of computer. Each unit of the Portable SSD T1 comes with a three-year limited warranty, and is available in 250GB, 500GB and 1TB with a starting price of USD 179.99. 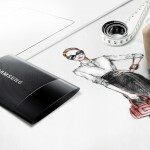 For more information, please visit www.samsung.com/T1. Transfer Speed** Up to 450MB/sec.